Does Dauntless Onslaught Trigger Heroic Twice? Heroic Stacks and End of Turn Effects? do abilitys of constilation set off heroic? Gadianten the thing is that I can't remove Akroan Crusader and other token spamming heroic creatures without removing Zada, Hedron Grinder , otherwise combos like Zada, Hedron Grinder + Seize the Day for huge amount of combat phases are useless. Odric, Lunarch Marshal is there to protect my creatures from my own boarwipes ( Sheltering Light or Ajani's Presence on any creature in first mainphase for boardwide indestructubility ) he also spreads "secondary" effects of cantrips like lifelink or firststrike to everyone if you cast them in response to his trigger at the beggining of combat phase. Rest in Peace - imho must be put in first place. Braid of Fire - cast more instants at your upkeep. Radiate - mana heavy but can be really devastating. Balefire Liege - pretty nice synergy with deck tech. Imperial Recruiter - nice tutor of course if you put more creatures in deck. Phalanx Leader - synergy with one bellow. Runaway Steam-Kin - synergy with one up. Labyrinth Champion - no need explanation. Thermo-Alchemist - no need explanation. Electrostatic Field - no need explanation. Firebrand Archer - no need explanation. Chromatic Lantern - no need explanation. Coalition Relic - no need explanation. 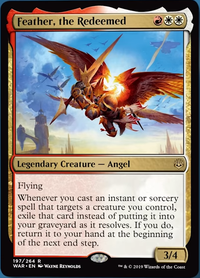 Really like Phalanx Leader because of the value it can give you by itself, whereas Grenzo, Havoc Raiser can give you potentially more value with other cards. 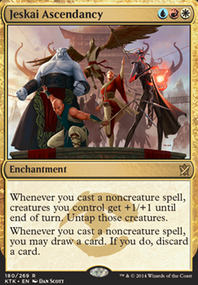 I see it in your sideboard, but should definitely be main deck imo because it is able to do more for your deck, and it fits in the theme of targeting with spells. I might take out a couple of enchantments for a couple more creatures if I were you - it can be a real drag drawing nothing but spells to point at creatures, but have nothing to do with them because your opponent keeps picking off your critters. Akroan Skyguard and Phalanx Leader are both worth considering. For your spells, I think the single best heroic enabler in blue/white might be View from Above - since all of your creatures are white, it will return to your hand every time you cast it, letting you enable Heroic as many times as you can afford! Hidden Strings is also strongly worth considering - you can tap two blockers before attacking, then untap up to two of your creatures to activate Heroic on them both. Getting a free pair of Heroic triggers so long as you can land a hit on your opponent each turn should wrap up the game quickly! 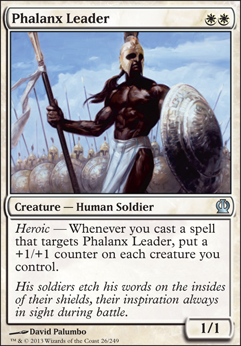 Hey I was looking into commanders with Heroic and tried my hand at Phalanx Leader too. Let me know what you think, my first impression is that I need a couple more 1 drop creatures. Akroan Skyguard , Phalanx Leader , and Centaur Battlemaster are all good heroic creatures. Cauldron Haze and Launch the Fleet are good budget options for targeting a bunch of creatures.